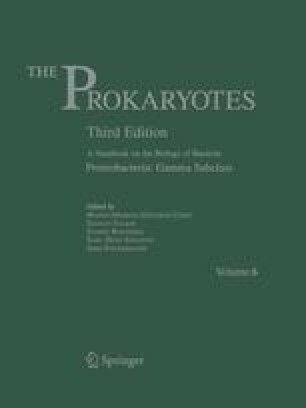 The Chromatiaceae are γ-Proteobacteria (Woese et al., 1985) and representatives of the phototrophic purple bacteria. They are also referred to as “purple sulfur bacteria” (together with the Ectothiorhodospiraceae) and typically grow under anoxic conditions in the light using as photosynthetic electron donor, sulfide, which is oxidized to sulfate via intermediate accumulation of elemental sulfur inside the cells. A number of species also can grow under chemotrophic conditions in the dark, either autotrophically or heterotrophically using oxygen as terminal electron acceptor in respiratory processes. Phototrophic growth, photosynthetic pigment synthesis, and internal membrane formation are strictly regulated by oxygen and become derepressed at low oxygen tension.